As US exporters face challenging and uncertain times in the wake of increasing trade barriers with China, the city of Austin, Texas has developed a partnership with Chinese internet giant Alibaba to boost exports of US-produced goods to Chinese consumers. The program, culminating in an annual “Alibaba Texas Midnight Pitch” event, was conceived after a 2016 business delegation visit to Alibaba’s Hangzhou headquarters, led by the Austin mayor’s office and the Office of Economic Development. With a mutual desire to develop business ties, the relationship blossomed into a first-of-its-kind showcase highlighting small local exporters – the product of extensive follow-up and engagement between Austin’s International Programs Director Casey Smith and Alibaba’s newly formed New York office. The first Midnight Pitch went online in May 2017. During the “pitch” itself, Texas-based producers had seven minutes to promote their products, QVC shopping network-style, via live-streaming to buyers in China. The event was timed to take place over local midday business hours in China. Professionally produced and choreographed from the Austin side, the program’s flow and tempo was crafted to capture and hold the interest of viewers who would be watching predominantly on mobile devices. Live music on-site was interspersed with the product intros, to give viewers a taste of Austin culture. Think of the Midnight Pitch as a lively variety show more than as a commercial: “infotainment” designed to sell. While the pitch lasted for only three hours, months of planning went into the event, starting with screening and selection of exporters who would participate. First, a pool of candidates was suggested by Austin-based SKU, the only consumer packaged goods (CPG) accelerator in the US; by Go Texan – the Texas Department of Agriculture product promo group; and by various local Chambers of Commerce. Then, interested companies applied for the opportunity. They were evaluated for ability and readiness to export to China and on the attractiveness of their product to Chinese consumers. Buyers through this program are generally looking for consumer goods like specialty foods and beverages, cosmetics, personal care items, fashion or lifestyle pieces, and baby products. Participating buyers are screened by Alibaba and have “stores” on the Taobao Global platform. The China-side buyers then sell the US products directly to Chinese consumers in a B2B2C marketplace transaction. Upon selection by the International Programs office, participating Texas companies were provided with coaching and training sessions on China export topics by the city and Blue Heron Holdings – in particular trademark and intellectual property considerations, business readiness, logistics, commercial agreements, and an intro to WeChat. Exporters received help preparing their pitches, with tips on how to best highlight product features for a remote, non-English speaking audience, on what to emphasize, and on how to work with the local Chinese emcee during the live pitch. Exporters received help practicing their pitches and even had a final dress rehearsal just before the live event. The Alibaba Texas Midnight Pitch helped small Texan exporters make connections to the China market. The first annual pitch featured 11 Texas exporters and 13,000 China-based viewers, giving great exposure for Texas and its local products as well as garnering some indirect sales. The second event in March 2018 highlighted nine Texas exporters and was viewed by a more targeted audience of 3500 buyers in China. After the 2018 pitch, every exporter had interested partners in China and four started transactions, with total sales so far of more than $2.2 million. This represents additional incremental revenue for Texas, an expanded marketplace for Texan companies, and more than 1000% ROI based on production and support costs of the pitch. Some of the most successful companies in the pitch include Amorado Tequila, Elta MD, Merlot Skincare, NurturMe, and SkiNourishment. The next Midnight Pitch is scheduled for May 2019 in Austin. 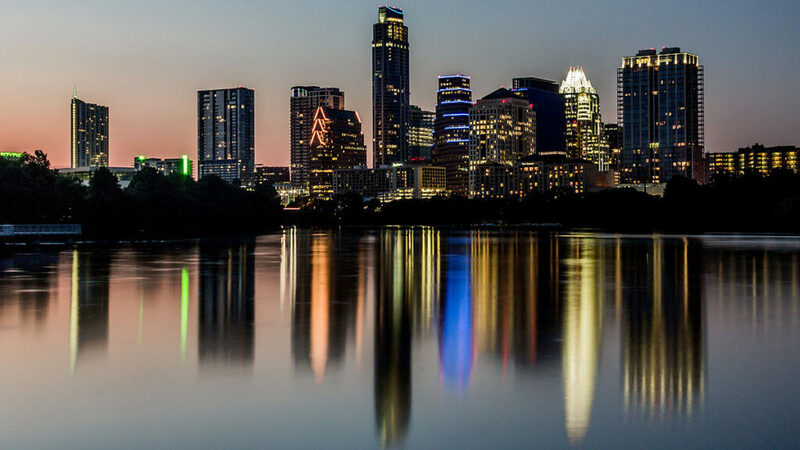 The Office of Economic Development intends to continue refining the program, which increases local employment and job stability, promotes Austin and Texas in general, and develops global connectedness through commerce. From Alibaba’s perspective, the Austin Midnight Pitch is part of the Taobao Global US Merchants initiative, which was formally announced in July 2017 to much fanfare by Alibaba founder Jack Ma during Alibaba Gateway ‘17 in Detroit. This platform is designed to connect small US businesses with Chinese distributors and help small specialty product producers build their brands in China. In conjunction with Austin’s 2018 Midnight Pitch, Alibaba also introduced US-based supply chain partners to help with logistics and communications between the Texas exporters and Chinese merchants. These initiatives and programs are having an effect – foreign products entering China under the cross-border e-commerce designation are growing. The cross-border e-commerce channel was projected to increase 43% from last year to RMB 758 billion ($111 billion) in 2018, according to McKinsey and iResearch, and China appears to be committed to continuing this flow of trade. In August 2018, the China State Council reportedly approved the building of new cross-border e-commerce pilot zones in 22 cities throughout China. Currently all cross-border e-commerce via Alibaba platforms comes through a pilot zone in Hangzhou. 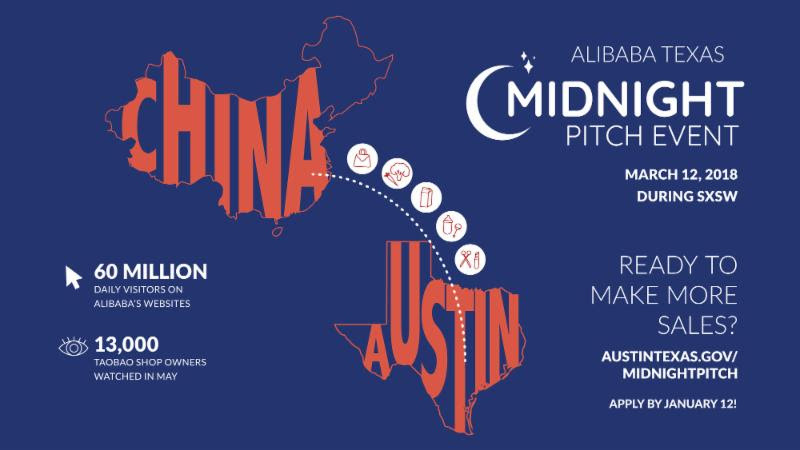 Austin’s Alibaba Texas Midnight Pitch continues to refine its exporter promotion and support process and the city greatly benefits from a vibrant artistic and film culture, which contributes to the high quality of event production. However, even without this infrastructure there are best practices that small exporters can follow to get the most from efforts to export to China. Think carefully about whether China should be on your near-term export roadmap. China is not the easiest destination for those new to exporting. Do you have the time, resources, and potential upside to make this a priority? It requires dedicated, regular attention. Plan ahead. Before going to China, get your intellectual property protection in order. Chinese trademarks, copyrights, and patents should be in place BEFORE doing business with China. China is a “first to file” regime, meaning if someone else claims ownership of your IP before you do, they will own it – even if they do not have the product in circulation. Understand what Chinese consumers are looking for – quality, authenticity and uniqueness of the product are often more important than price in the CPG space, particularly for foreign goods. Position your product accordingly. Relating to the above, you may need to educate consumers on how your product is made and used for them to realize its full value. This should be approached with some idea of Chinese cultural perspective and communication style. In any agreement, have a clear understanding of commercial terms and expectations of the Chinese distributor/merchant and supply chain logistics provider. There are many details to work out and nothing should be taken for granted. Check into packaging and labeling requirements of your product for the China market. Content does not necessarily need to be translated, but there can be regulatory requirements for food or other products that differ from the US. For many exporters, seeking outside assistance in the early stage of developing China exports has tremendous value. The US Department of Commerce Export Assistance Centers, local chambers of commerce, and small business development offices, trade organizations, and independent service providers all may have low cost resources available. Preparedness and knowing what is ahead is the number one factor in building long-term business with China. Betsy Neidel is the founder of Blue Heron Holdings, a China business advisory firm. Her most recent project promotes a new approach for the success of women business professionals in a Chinese/global environment.